Fit4Baby® is a program designed to strengthen the body for all the changes it will experience during pregnancy. These classes exclusively focus on pregnant moms! Regular activity such as Fit4Baby® classes can help to reduce many maternal aches and pains, increase energy during pregnancy and may speed the labor, delivery and recovery process. According to the American College of Obstetricians and Gynecologists (ACOG), exercise is just as important during pregnancy as any other time of life. Stroller Strides® is a stroller-based fitness program designed for moms with little ones. Our classes are 60 minute total body workouts which incorporate power walking, optional running, strength, toning, songs, and activities. Certified fitness instructors offer a variety of fun classes. 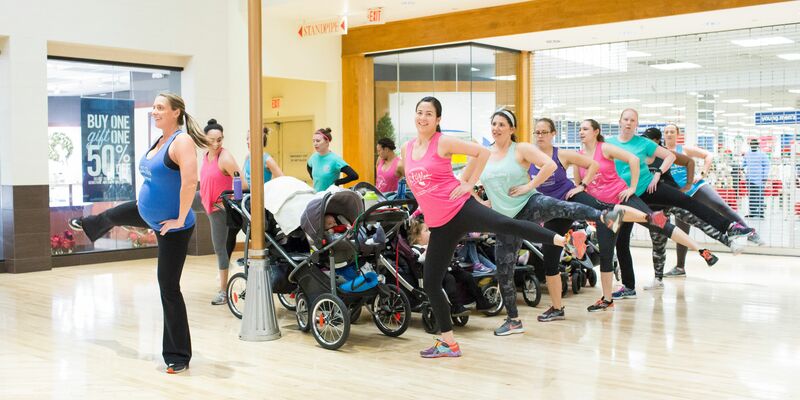 Our Mommy & Me classes Stroller Strides® and Stroller Barre® provide mom with an awesome total body workout all the while engaging and interacting with baby. We offer Stroller Barre® several times a week at various locations and times. Please check schedule for accuracy. You'll need a stroller of any kind, water & mat/towel for abs. It's suggested you bring your child's favorite toy/snack as well. activities for your little ones. It's a great way to work on balance, strength and posture. HIIT training in small group environment. Designed for the busy mom in mind. All classes include total body functional fitness, and end with a relaxing stretch and meditation to allow your mind and body to reset before tackling your next challenge of the day. Body Back Membership allows you to attend unlimited classes at any of our franchise locations. We offer Body Back seven days a week at various times and locations. Join us in Lorton, Burke, Fairfax Station and or Kingstowne. Check online schedule for dates and times. Body Back® Transformation is a results-based workout designed specifically for women to focus on themselves. Full 8 week transformation sessions include before & after assessments, before & after photos, unlimited* HIIT (high intensity interval training) classes per week, a digital meal plan & food journals, at home workouts, and an online support group with additional fun weekly challenges to keep you motivated along the way. This class offers participants a child-free intense workout (Lorton a.m. classes offer childminding!). Pre-Enrollment along with full payment is REQUIRED to reserve your spot. Our Run Club® is designed for any level of runner, from beginner to expert. Bring the entire family! We are a co-ed stroller-friendly running group (solo and stroller running welcome). You'll learn about the fundamentals of running including running gear, running form, injury prevention, pace, etc. Join us every Sunday morning! Fit4Mom LSBWK NoVa Run Club offers a group based running program, leading up to a 5K or 10K race. This program is designed for beginner or experienced runners, and offers you the motivation and encouragement you need to meet your running goals. Group runs are stroller friendly, yet not required. We are excited to host a FREE PRENATAL OPEN HOUSE in Lorton. Helping moms gain strength in motherhood right from the start. Come on out to learn more about our prenatal fitness program, enjoy light snacks & refreshments, guest speakers on various prenatal topics, a free Fit4Baby prenatal total body fitness class. Fit4Baby® is a prenatal fitness program that teaches women how to exercise safely and effectively throughout their pregnancy. All trimesters welcome. The hour long class is interval based, combining elements of strength training, cardiovascular exercises and stretching and balancing exercises. Body Back HIIT is a results-based program that includes nutritional coaching, food journals, meal planning, recipes, nutritional support, before/after fitness assessments, body measurements, and photos, at-home workouts and an amazing community of women. Join us for our free demo classes to find out first hand how empowering and awesome it feels to work on your health and wellness from the inside out. This is our 5th annual MOM event of the year! Join us in celebrating YOU - all the hard work that goes into mothering shouldn't go unnoticed. We are here to celebrate all the wonderful things you do as a mom. Join us for our free event - we'll have free snacks and beverages following our free Stroller Strides class, vendors, free face painting, activities and of course we’ll finish off with our annual prize giveaway. This will be the only stroller based class on this day - please spread the word to make sure ALL MOMS come out to Burke Lake Park to celebrate! Wear comfy workout gear, bring stroller of any kind to keep your littles safe during workout, bring sunscreen, water and a mat/towel for floor exercises. Upon entering park, turn left then right, park int he parking lot near the mini golf complex, then proceed to the large grassy area facing the main entrance! You'll see us set up already and our team will be there to greet you! Join us for our 'Bumps & Babies Social'. We invite all stages of pregnancy and all the mamas that have had their babies in the last 6 months to gather on the last Sunday of the month. Get to meet new friends, share stories, sip coffee and get support in all things motherhood. Our Run Club is designed for any level of runner, from beginner to expert. Bring the entire family! We are a co-ed stroller-friendly running group (solo and stroller running welcome). You'll learn about the fundamentals of running including running gear, running form, injury prevention, pace, etc. Join us every Sunday morning! We are so excited to see you and your little(s) at our KAY Family Yoga class. Please wear comfy clothes and remove shoes & socks for class. We will provide yoga mats for you - feel free to bring your own if you wish. Try to arrive at least 5 minutes before class to allow your child to settle in. Classes are limited to 12 tots plus accompanying adult. If you're not able to participate, please remove yourself from roster at least 2 hours prior to allow room for wait-listed families to take your place. Thank you! There is ample parking behind the building, address is 9000 Lorton Station Blvd Unit Q. See you at our studio! FREE Kings Park Outdoor Launch! All levels, all body types - This class is amazing for anyone looking to improve their flexibility!! We will start out with a warm up, for your joints and muscles. We will then be working on hamstrings, hip-flexors and hips or back and shoulders. Using active and passive stretching we will focus on the breath and releasing tension throughout the body as we stretch. We will go over a variety of stretching methods to deepen your posture and improve flexibility, range of motion, and technique. Each class will end with a candlelit stress reducing meditation to reset your mind & body. ALL THE GOODNESS OF OUR TRADITIONAL 8 WEEK SESSION BROUGHT TO YOU THIS SUMMER IN TWO 4 WEEK MINI SESSIONS - easier to commit to over the busy months ahead. Check it out! S360 is a stroller optional, speed, agility, and quickness class. It's designed to get your feet moving and your heart pumping. S360 is a great compliment to a Body Back session, Run Club training, or as stand alone program! S360 meets Wednesday & Sunday at 10:30am. Every Sunday is family class! Bring any adult family member along for FREE every week! Please note that any children in attendance must be buckled safely in the stroller for the duration of class.